Here at Biegerts Jewelry, we also offer jewelry appraisal. There are a variety of reasons why you should have your jewelry appraised... Insurance,For Sale, and For Inheritance. We offer on site appraisal with our staff Appraiser Terry L. Biegert. The time the appraisal takes can vary depending on the piece, and it costs $100.00 minimum for the first piece of jewelry. Please call us at (618) 345-3399 or send us an email here (info@biegerts.com) with any questions you may have about this process.We are GIA and ISG Register Gemologist Appraiser. Generally speaking, experts advise consumers to have their jewelry appraised about once every two years. That’s to keep values up to date for insurance and/or resale purposes. However, today’s volatile market has made it imperative that owners be aware of the current value of their jewelry. Before you rush out to the nearest appraiser, however, there are a few facts you should know. First of all, it’s wisest to have your precious possessions appraised by an expert with a fine reputation, such as your local jeweler. You will pay a small fee for the service, but you will be billed for the expert’s time only, not the value of the jewelry. Beware of the “appraiser” who bases his charges on the jewelry’s value. 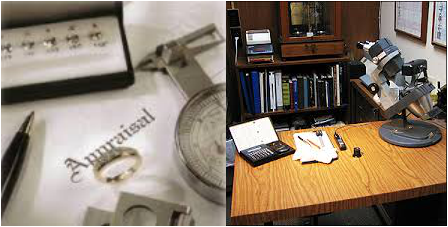 Next, be aware that there are three types of appraisals, one for insurance purposes, another for selling the jewelry, and one for settling estates. Be sure to discuss the purpose of the appraisal, because this will affect the stated value. Finally, it’s important to have your appraisal done by someone you trust. Our trained experts have had many years’ experience evaluating fine jewelry, gemstones and watches. What you will receive is a professional evaluation of your jewelry, the identification, grade and weight estimation of the gemstones, (diamonds may be plotted or photographed), the fineness and estimated weight of the precious metal, its quality and workmanship and, most important, its value by current market standards. Q. Why should I worry about an inaccurate appraisal? A. If your jewelry is over-appraised, you’ll pay a higher insurance premium. If it’s under-appraised, and you file an insurance claim against it, the insurance company will replace it with an inferior piece. Q. How often should I have my jewelry appraised? A. Every few years, to reflect changes in market prices and relative values of various pieces. Q. What does an appraisal cost? A. Most appraisers charge an hourly rate, which varies. It’s probably best to avoid appraisers who charge a percentage of the appraised value.